Mascara de Bronce asked to cash in his mega title shot on this show. Johnny Mundo wasn’t actually there, but Hernandez showed up instead with the idea that Mascara de Bronce wasn’t worth Mundo’s time. It didn’t appear the title was on the line, it’s unclear if the title shot was on the line. Bronce won, but Hernandez took the suitcase with the title shot anyway. Lanzeloth replaced Ricky Marvin, but Marvin was said to still be around (not around here, but they’re keeping his feud going.) Averno fouled Lanzleot for the win. Texano and a cage was added to the match. Unlike every other cage match in AAA, the cage match here was to decide a winner by first person out. Fantasma & Texano left at the same time, so Vampiro declared they’ll have a three way with Mundo for all the tiles at TripleMania. Hernandez distracted Kross from escaping for no clear reason. Vampiro took the case back from Hernandez and handed it to Mascara de Bronce. Air Date: July 1 & 8, maybe. AAA’s pictures make the arena look full, but other shots show rows of empty floor seats. They look partly occupied early on, then not at all later on when everyone smartly moves up. I said AAA had 2 of 6 advertised matches last night, but I did forget that the Pimpinela/Mamba match was listed as a bull terrier match for reasons no one ever knew. I guess you can call it 1 of 6. I don’t understand why this feud happened, since it never meant anything except to the few people who remember Mamba taking Pimpinela’s hair four years ago. Top two matches were predictable outcomes, but at least in the ways that made the most sense. The Poder del Norte team only seemed to exist as a way to have a main event for this show while they were running out the clock to Wagner/Psycho, but I’m not sure they ever got them to the point where people really card. it’s a win for those guys, even if they didn’t care, since it was incredibly unlikely they’d get a main event mask loss on AAA TV prior to this. Pagano getting destroyed in his hometown is straight up WWE booking, so no big surprise it’s being done in AAA now. Just like the main event, the tag team title stuff was just something to buy some time because TripleMania is the only show that AAA really cares about this year, and the title change was just a fake out to see if they could convince the fans of some other outcome. (Like with Poder del Norte, I don’t think it actually worked.) 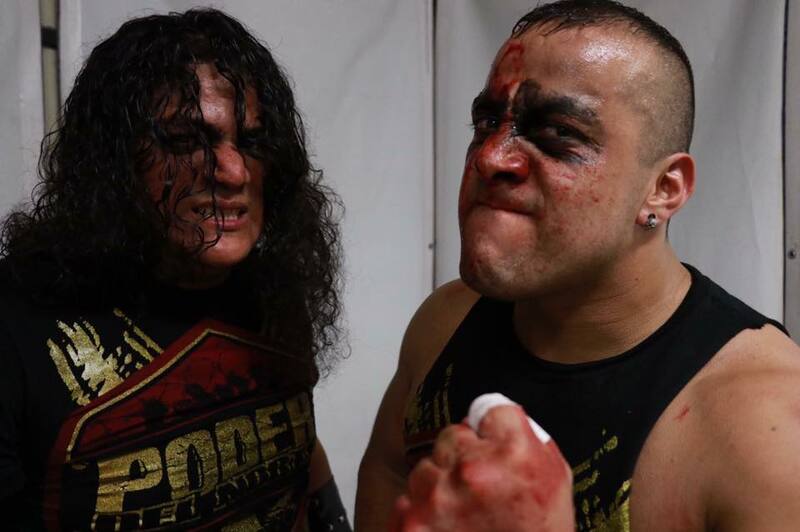 I dread whatever death match he and Mesias are going to have in August. I’m not a fan of going back to Cuervo & Scoria because they weren’t that good as a champs before and there’s some added benefit to keeping the belts on Aerostar & Drago if they’re the guys AAA is trying to send elsewhere as a stars. You can tell this is being written by someone who doesn’t watch a lot of lucha libre, because they didn’t do the cage match rules the lucha way, they did them in a way that actually makes sense. Again, the draw to set up a three way match is a repeated WWE trope being used here. I never could figure out how Kross was supposed to fit all their TripleMania plans and it doesn’t seem like they did either if he’s maybe feuding with Hernandez. Maybe it comes off better on TV, but the Mascara de Bronce/Hernandez thing comes off as something specifically written so Vampiro can come off as the big hero. I’m not sure why you would need to write that – I think people would assume ego, but it’s also possible they’ve got the Vampiro rudo turn planned (main event of TripleMania?) and they’re having him be an over the top hero to make it all the more shocking when he costs Psycho (or I guess Wagner, but Psycho) his mask. working TripleMania 25 card for August 27, version 1.0. Italics indicate match not official. No idea where Kross fits. No idea where Angelico fits, and he’s supposed to be back by July. Maybe they have a match? No idea, but they’re already running out of room and Impact (& NOAH?) guys are also going to need a spot. If Mascara de Bronce was a smarter ex-goat boy, he’d ask for his title match on this show. He may still lose but he’ll get to be on TripleMania and it’s not clear he’ll be on otherwise. How did Lanzelot end up with a better spot here than his borther Dinastia, who seemed to be the one who got him in? Next taping is two weeks from today in Nuevo Laredo.